The death of Joseph Duncumb of Moat House, Sutton Coldfield, in April 1793 no doubt cast a blight over his daughter Elizabeth’s plans, as she was on the point of getting married. However, only one month later, on May 21st 1793 Elizabeth Duncumb was married to Shirley Farmer Steele Perkins of Orton on the Hill in Leicestershire, and they moved in to Moat House, which they had inherited. Steele Perkins was a distinguished barrister, serving as Warden of Sutton in 1802 and as Deputy Lieutenant of Warwickshire and Leicestershire, and commanded the Royal Sutton Coldfield Volunteers, a local militia formed during the Napoleonic Wars. S.F.S.Perkins was the barrister who led the prosecution in the Mary Ashford case of 1817, while another Sutton solicitor, Edward Sadler, led the defence. By 1840 William Steele Perkins, son of S.F.S., was living at Moat House with his large family, and the house was probably extended at this time to accommodate his wife, eight children and three servants. In 1845 the valley behind Moat House was part of the planned route for a railway line, which would have cut across the land attached to houses in High Street and Lichfield Road - three of the principal objectors were Sadler, who lived in High Street, Perkins of Moat House, and Mendham who lived near Boswell Road. The Steele Perkins dynasty continued at Moat House - after the deaths of Shirley Farmer aged 84 in 1852 and William in 1864 it was left to William’s son Edmund. Edward Arthars, a wealthy draper who lived at Fox Hill House, bought Moat House in 1869 from Edmund Steele Perkins and then in 1871 it was sold by auction to the Sadler brothers, Richard Hurst and Ralph Stanley, both in their early twenties. Ralph, the younger brother, moved to a new house designed for him by the eminent architect Ernest Newton on his marriage in 1893, while Richard Hurst lived at Moat House for over forty years. Whereas the Steele Perkinses had been rather aloof and reserved, “Moat House under Sadler’s ownership was a warm and bustling town mansion, with an active family life, as well as being used to entertain business and political associates”. Sadler had his solicitors offices in High Street, and grew rich through property development in the rapidly growing town. He was a co-founder in 1870 of the Sutton Coldfield news, Sutton’s first local newspaper; elected as a councillor to the new Borough Council in 1886, he progressed to be Mayor of Sutton Coldfield from 1903 - 1906. The gardens of Moat House were particularly fine in Sadler’s day, his wife Emma being particularly interested in garden design, but the house itself remained unaltered, although the sundial on the south wall, which is thought not to be original, may have been installed then. Sadler died in 1917, and Moat House was purchased by another solicitor, Arthur Heaton, who was then living at Fox Hill House. Heaton kept up the rich social life of Moat House, continuing the annual Royal Sutton Horse Show in the grounds and a round of musical evenings and garden parties which continued until the outbreak of war in 1939. 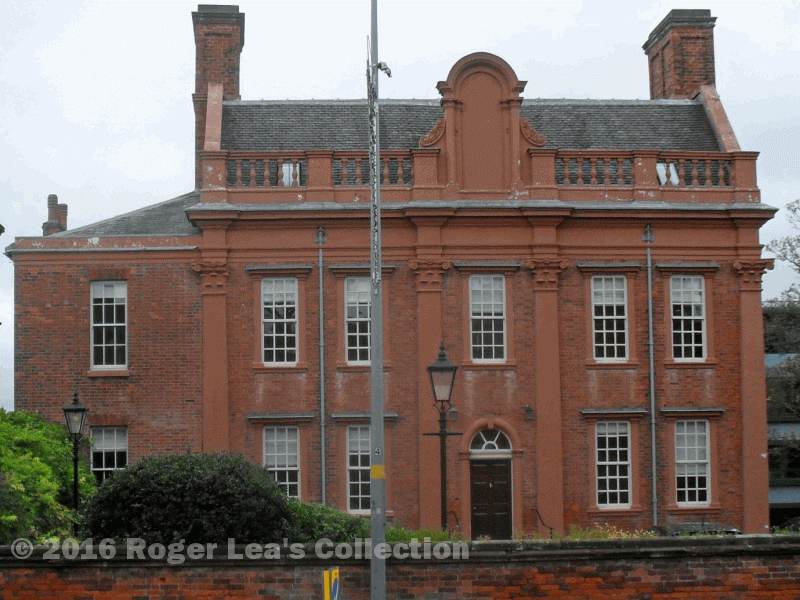 In 1948 Moat House was acquired by Warwickshire County Council for educational purposes, and was in a poor state of repair in 2000 when it was acquired by Sutton College and restored to its former glory. Moat House in 2016 - the nineteenth century extension to the left destroys the symmetry. 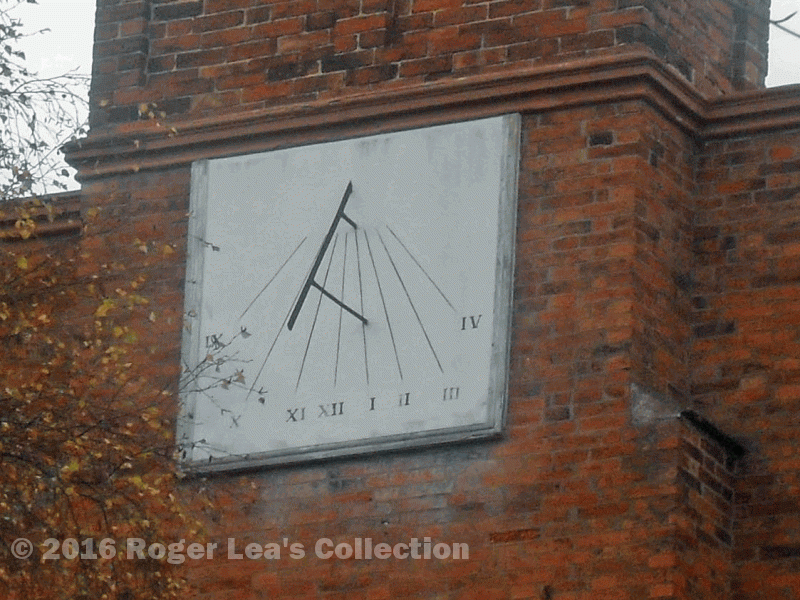 Sundial on the wall of Moat House, probably added as an ornament by Richard Sadler. The wall faces a few degrees west of due south, so the gnomon is aligned with the one o’clock marker rather than twelve noon.